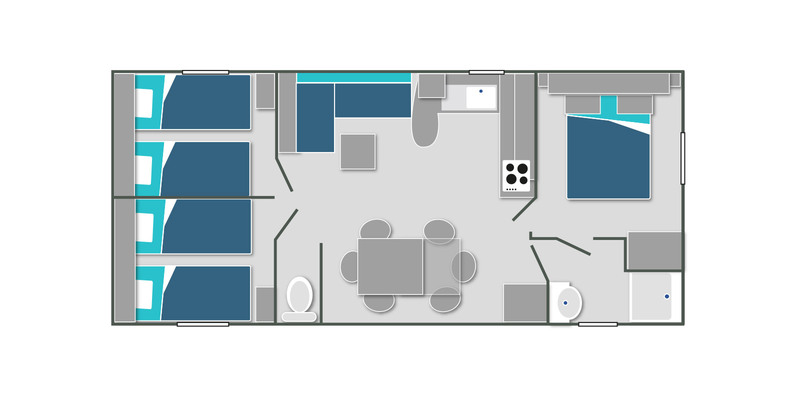 A large mobile home with 3 bedrooms, the La Combe model can accommodate up to 8 holidaymakers thanks to its convertible bench seat which offers two additional beds in the living room. Its 31 m2 surface area is optimally configured to offer the best living space to a large family or group of friends, while respecting everyone's privacy. The parental bedroom has a 140 cm wide bed and a private direct access to the bathroom. 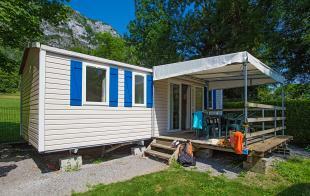 The other two rooms, opposite to the accommodation, are furnished with single beds 90 wide. The living room offers a pleasant lounge area with sofa bed, coffee table and television, an open kitchen and an extension table for family meals. WCs independent of the shower room are accessible from the main room. Outside awaits you a large covered terrace furnished with a complete garden furniture for 8.